Food and Consumer Behavior – Why do we eat what we do? Food Labeling – How can we make it relevant and clear? Nutrition Education – How can we make it effective and fun? Food and Wine – How can we promote healthy portion sizes and sustainable consumption? Building research laboratories with Lego bricks is one of my first memories. I have always been interested in how things work, especially nature and the human body. I started my professional research career as a biochemist and my interest in the way that chemicals interact with human bodies began to evolve when I realised that the food we eat every day has the biggest impact on our health. I wanted to know everything about health and healthy eating. But, I also realised that just knowing what is healthy is not enough. This is why I’ve extended my studies into the field of food and consumer behavior and am now leading research at the interphase between Nutrition, Dietetics and Psychology. I want to improve population health by contributing to better nutrition education, communication and through creating healthier food products and environments. My dream is a food environment that makes choosing healthy foods and portions easy. Dr Bucher is a Nutrition Education and Consumer Behavior Researcher with a background in Biology (BSc 2007, MSc 2008) and Human Nutrition (Master of Advanced Studies 2010). She was awarded her PhD in 2013 from ETH Zurich (ETHZ), Switzerland, which ranks 7th in the world in the QS World University Rankings 2019. After her PhD she held a teaching and research position at ETH Zurich for two years. 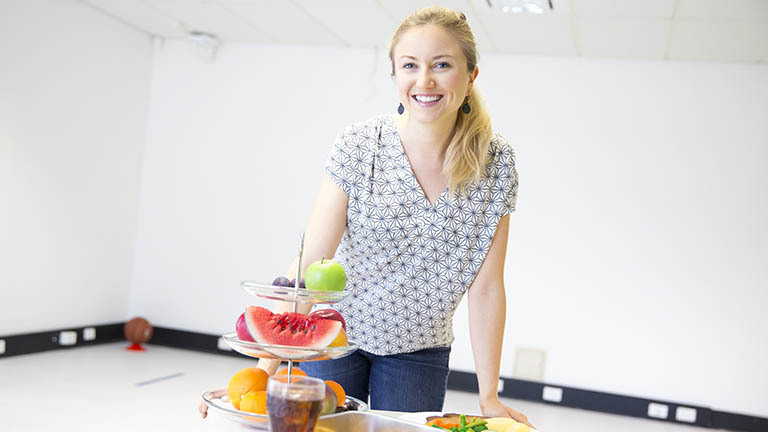 In November 2014 she joined the University of Newcastle (UoN) Priority Research Center for Physical Activity and Nutrition (PRCPAN) with a Mobility Fellowship from the Swiss National Science Foundation to collaborate with dietitians and engineers and to combine her methods with augmented reality and other smart technologies and develop applications in nutrition education. Dr Bucher’s unique combination of natural science and social science research skills have enabled her to develop and lead a successful consumer behavior and nutrition education research program. She has developed strategic collaborations with several international research institutions and leads interdisciplinary research focused on the development and application of innovative tools and technologies to improve nutrition education, and generate knowledge on how to create healthy food environments and promote healthy food choice. She works with experts in Education and Computer science to create better tools and resources for nutrition education in primary schools. These include educational games that integrate curricular content in Mathematics and Nutrition. Dr Bucher also woks with different stakeholders, including food producers and distributors to improve food products and nutrition information to help people making healthier food choices and choosing the right portion sizes. Her outstanding achievements have been recognised with international awards, fellowships and grants totaling over $5.5 million. These include prestigious Post-doctoral Fellowship awards by the Swiss Foundation for Nutrition Research (SFEFS) and the Swiss National Science Foundation (SNSF), which are only awarded to outstanding young scientists. Dr Bucher has attracted competitive funding from the European Union (Horizon2020), the SNSF, the SFEFS, and led several successful industry collaborations. Improving peoples lives through better food products, environments and knowledge.